After more than a year of dodging bullets, Stargate: Resistance developer Cheyenne Mountain Entertainment has filed for Chapter 11 bankruptcy. 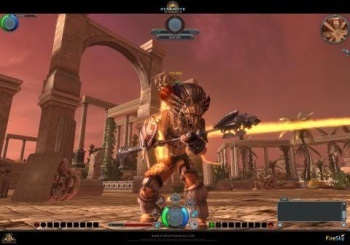 Cheyenne Mountain's financial trouble first came to light back in December 2008 when it was revealed that employees, then hard at work on the still-unreleased MMOG Stargate Worlds, had gone more than three weeks without being paid. The company was eventually sued over unpaid bills and in mid-2009 reports of trouble between Cheyenne and Stargate owner MGM bubbled to the surface. But somehow Cheyenne was able to keep dancing and while Stargate Worlds remains hung up in development limbo, the company did manage to put out the online shooter Stargate: Resistance earlier this month. Cheyenne may have hoped that the launch of Resistance would give it the shot in the arm it needed to keep the ball rolling, but all that turmoil has finally become too much to bear. In a statement posted on the official Stargate Worlds forums, Cheyenne Mountain Community Manager "Gabriel_FS" wrote, "Cheyenne Mountain's corporate structure has undergone some dramatic changes in the last few weeks, and that has resulted in various actions such as the filing for Chapter 11. Certain parties believed that was the right thing to do, other parties do not and this is still being evaluated and may be rescinded. Even if the bankruptcy should go through, however, Chapter 11 simply allows a company to restructure its debt to a manageable plan approved by the courts. It does not absolve a company of debt, and it does not shut it down or otherwise affect its daily operations." In an interesting twist, Cheyenne Mountain has also joined in litigation against its former chairman and CEO, Gary Whiting, saying it discovered "a few months ago" that he had been named in a lawsuit filed in Utah over financial shenanigans between Cheyenne and Garvick Properties, another Whiting-controlled company. Whiting has been removed as a board member and his employment has been terminated; in a separate statement, the company said, "It is uncertain at this time what the affect of Mr. Whiting's actions and the pending litigation will have on the Company's operations and financial condition." It's hardly what you'd call good news but on the upside, it means that Cheyenne Mountain will be with us for awhile longer and that the possibility remains that someday, Stargate Worlds might actually see the light of day. In the meantime, the Cheyenne community manager said the development team is continuing to work on upgrades and expansions for Stargate: Resistance. "This will all be sorted out in the legal and proper manner, and all of us on the development side of things hope it's done as quickly as possible," he added. Thanks to thenumberthirteen for the tip.